Whether it’s for a relaxing evening at a five-star resort, spa, hotel or your own home, Robemart has everything you need to feel luxurious and pampered. Along with premium robes, bath wraps, and more, we also feature a selection of deluxe hotel and spa slippers for head-to-toe comfort at wholesale prices. Our plush and ultra-soft velour slippers are designed to match our terry velour robes and bath wraps for a complete lounging set. 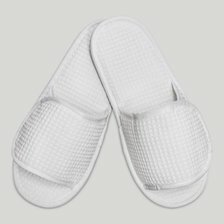 Made with plush padding and brushed terry, these premium hotel slippers feel heavenly soft with every step. While your color options are between black or white, you get to choose between closed-toe options for extra coverage and warmth, open toe styles with an adjustable Velcro top or the classic plush thong design. Perfect for the hotel, spa, or relaxing at home, these ultra-luxe spa slippers add the finishing touches to your super comfy loungewear ensemble. If you love our best selling waffle robe, make it a complete set with matching waffle cloth slippers for all-over comfort and style. The hatched cotton knit top helps keep your feet warm and cozy while the skid-free EVA sole gives you secure footing. 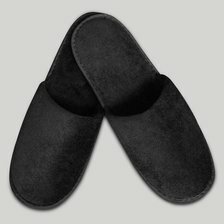 Like our selection of velour slippers, these cushy hotel slippers also come in closed toe, open toe, and adjustable Velcro styles. When you pair one of our premium robes with matching slippers, it gives you a classic lounging style that brings the comfort of home wherever you go. Our selection of velour and waffled cotton hotel slippers are perfect for keeping your feet warm and cozy when you’re lounging and relaxing. The hatched pattern of the waffled slippers are breathable and absorbent, making them a favorite choice for hotels, spas, and beauty clinics. 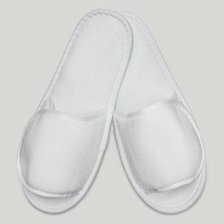 With a soft cushion to support the feet and plush velour that dries quickly, terry cloth slippers are another luxurious option for hotels and spas. At spas and resorts, your clientele will feel like VIP when they’re lounging in a luxury robe and matching slippers, the ideal combo for rest and relaxation. A loungewear essential, our deluxe spa slippers are also the perfect addition to a matching robe that you could gift for birthdays, bridal parties, or other special events. Offering the best in style, quality, and affordability, Robemart is the number one destination for luxury spa and bath accessories, including wholesale slippers, robes, bath wraps and more. We also offer free shipping on orders of $150 or more, plus quantity discounts for even more savings. Our customers also appreciate our 100% satisfaction guarantee, which includes hassle-free returns and free exchanges. Shop our collection today and indulge in luxury at an affordable price.